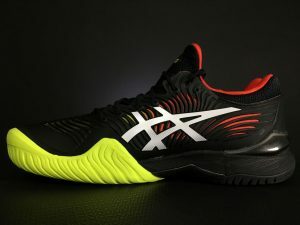 Asics has taken a good chunk of the performance tennis shoe market with mainstays like the GEL-Resolution 7, Solution Speed FF, and the GEL-Court Speed. 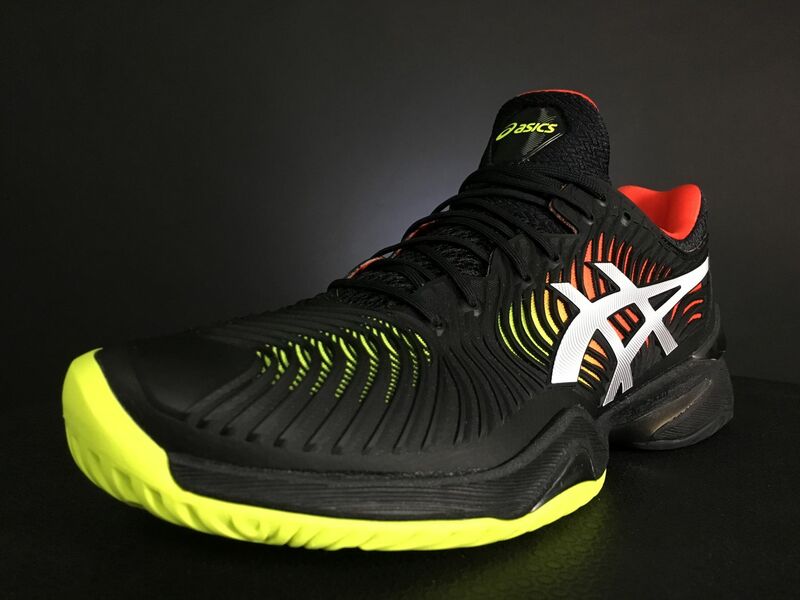 The Resolution is Asics’ durability offering, and the two “Speed” models cut out the weight for faster response times and a court-hugging feel. They launched a shoe a couple years back called the GEL-Court FF. The model was Asics’ first tennis shoe with a MONO-SOCK construction and FLYTEFOAM technology. The Court FF was an incredibly capable shoe and was used on tour by consistent top 20 ATP player David Goffin. 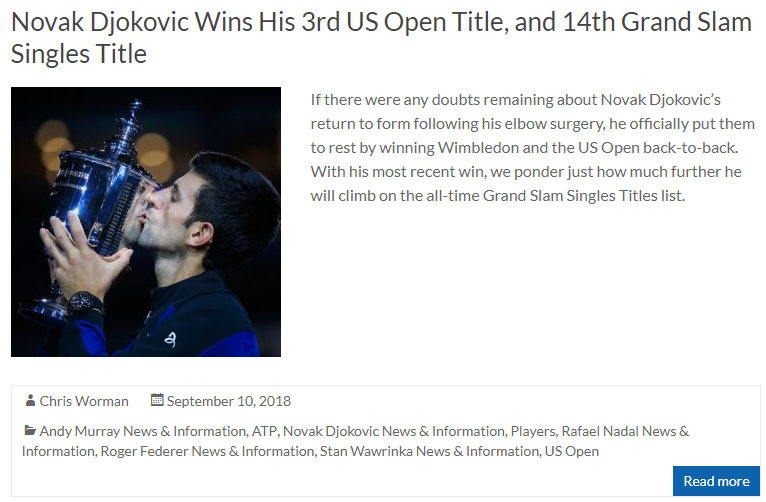 Novak Djokovic finished 2018 with a flurry, and wore his GEL-Resolution 7’s to win Wimbledon and the US Open. 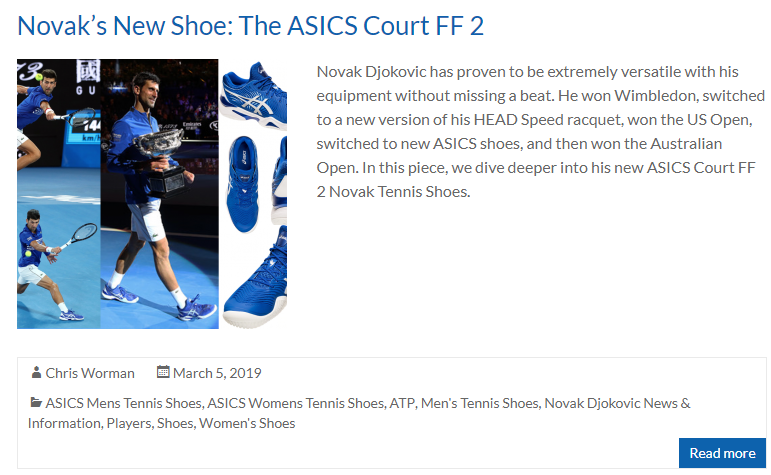 After enjoying much success with the shoes, Djokovic collaborated with Asics during the offseason, and showed up in Melbourne sporting completely different shoes; the Asics Court FF 2. Whereas the Resolution offers strong durability, and the Speed models are lightweight and quick around the court, the Court FF 2 promises the perfect blend of support, speed, and comfort. 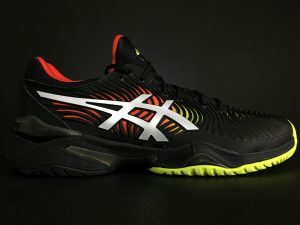 The nuts and bolts of the Court FF 2 feature several prominent technologies found throughout the Asics tennis shoe line. The FlyteFoam midsole provides consistent bounce and responsiveness by using an organic super fiber construction. The super fibers are more durable than the typical softer, low-density foam. 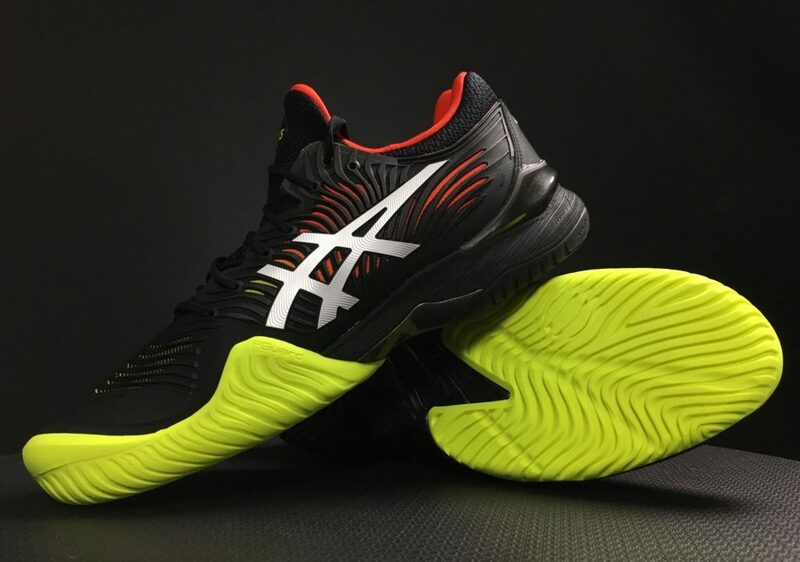 Asics Trusstic system provides the comfort and stability needed for hard court tennis, and the new Twistruss technology makes the shoe more agile by enhancing internal twist (for sudden change of direction) and reducing the weight of the sole. The Mono-Sock construction, a key feature from the previous Court FF, is an elastic internal sleeve that secures the foot in lieu of a traditional tongue construction. Another update from the prior version is the PU covered upper. The newly engineered upper provides confidence-inspiring, form-fitting comfort without a reduction in support. When I laced up the Court FF 2 for the first time, the shoe felt roomy with tons of space in the toe box and forefoot. Sometimes this can be a bad thing because the foot can slide around a bit if not secured inside the shoe, but with the Court FF 2, the space I felt was the stretch of the Mono-sock construction and new upper. I coined a new term for the sensation, and it’s called FlexStability. Fans of the previous GEL-Court FF noted the shoes ran longer than average, but I found the Court FF 2 to fit true to size. Let’s get back to the Mono-sock construction. Several brands have adopted an “inner sock” that stabilizes and guides the foot during play, but with the Mono-sock I felt plenty of support and connected to the shoe. In other words, my foot wasn’t swallowed up in a vacuous shoe, but instead it felt cradled and stabilized laterally and vertically. I cannot recall a shoe on the market where the sock liner and the upper work in tandem so well. As far as the toe area goes, the Court FF 2 has a reinforced toe drag guard that is more substantial than either the GEL-Resolution 7 or the Solution Speed FF. It is immediately noticeable that the extra protection is to the medial side (where the big toe fits in the shoe). It makes sense to upgrade the durability in those areas for the best hard court slider in history Novak Djokovic. 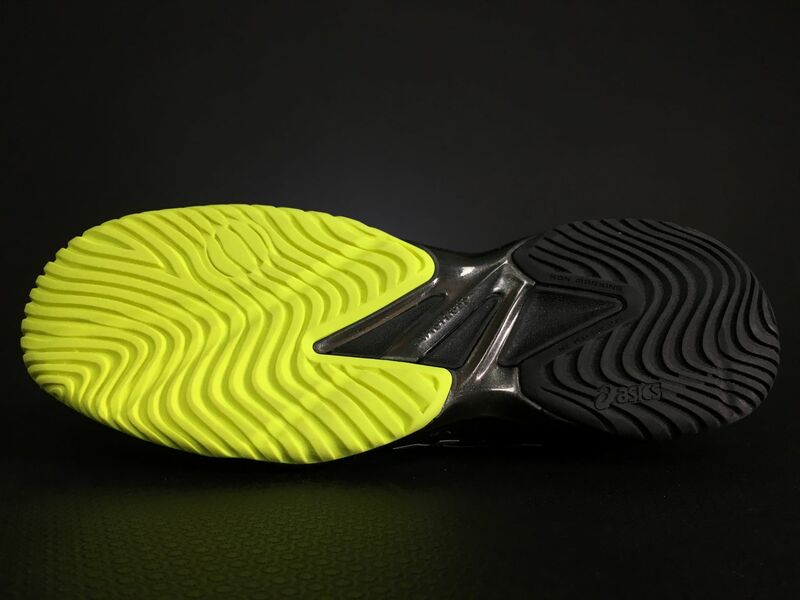 Asics smartly reinforced these areas and didn’t add any bulk anywhere else in the shoe. For what it’s worth, after 15-20 hours on court, I only noticed scratches on the Court FF 2s in the spots they beefed up, so it seems they were an effective and worthwhile upgrade. My favorite aspect of the Court FF 2 is the connection to the court surface it provides. The rear-foot and forefoot GEL cushioning systems provide comfort, but you never feel disconnected or too high off the court. The arch support is enough without being too high or low, and I felt the whole length of my foot in contact with the court. I felt a remarkable sense of balance when wearing the Court FF 2, and it inspired a lot of confidence amidst sideline to sideline singles points. The performance tennis shoe world has changed, and now we consistently see high-end shoes in the $130-$160 range. The Court FF 2 is a pricey tennis shoe, but I dare say if you are a frequent tennis player, and you appreciate outstanding quality and performance, the Court FF 2 will not disappoint. For the release of the Court FF 2, Asics is offering men’s and women’s sizes in contrast to the unisex sizing from the previous GEL-Court FF.